Despite the success of Hollywood, some icons never cross the Atlantic successfully from West to East. Say 'Babe Ruth' to the average Brit, and you'll conjure an image of a small girl too young to play ball games. Likewise, say 'Don Buchla' in the UK, and you'll probably be asked whether he was a character in The Godfather. Strangely, that description is not as far from the truth as you might imagine. In the USA, there are three 'godfathers' of synthesis: Alan Pearlman, Bob Moog, and — largely unknown in the Auld Country — Donald Buchla. 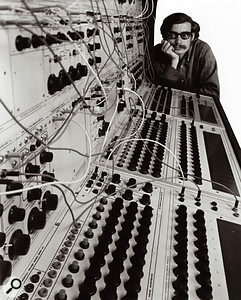 Buchla was a contemporary of Moog, and like Dr Robert, he produced his first synthesizers in the 1960s. 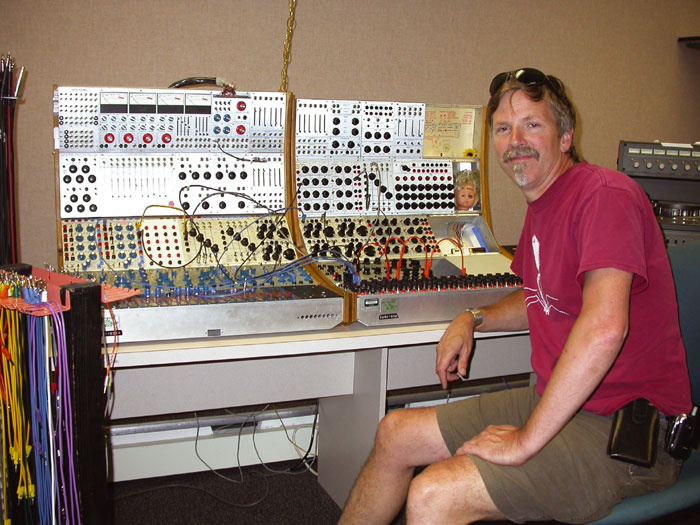 He continued to do so throughout the '70s and '80s (see the box on the history of Buchla & Associates), but the commercial acclaim and recognition afforded to Moog eluded Buchla, and he concentrated on controllers in the '90s. By the early years of this century, he had slipped into the backwaters of the music industry, but in 2002, he decided to reinvent his most successful synthesizer, the Series 200 from the early '70s, bringing it up to date while retaining as much backwards compatibility as possible. Three years later, the result has arrived. It's a feature-packed synthesizer with a staggeringly huge price tag (see the final page of this article). It's the Buchla 200e. Before looking at its modules, which I'll do in detail next month, there are many global aspects of the 200e that need discussing. That's because there's little about the instrument that's obvious. For example, it's not a modular synthesizer as you would normally use that expression, nor is it an integrated synth, nor is it semi-normalled in any conventional sense. Furthermore, despite misleading marketing that describes it as employing 'straight analogue synthesis', the 200e is not a pure analogue synth. But it's not purely digital either, nor is it what we would normally describe as 'digitally controlled-analogue'. It's a hybrid, but not in the same way as other hybrid analogue/digital synths. Confused? I don't blame you. The 200e is remarkably small, taking up about the same amount of room as a Minimoog with its control panel flipped up, but it feels significantly lighter. It comprises three rows of modules mounted in three cases (known as 'boats') arranged in a neat wooden design that flips open for use. When the 200e was first announced, owners of existing Series 200 systems speculated that the two systems would be completely inter-compatible, allowing you to run 200 and 200e modules in the same cases, and off the same power supplies. However, that has proved not to be the case. While the depth of the boats is just sufficient to house the deepest of the 200e's modules, some of the earlier 200-series modules are too deep to fit. 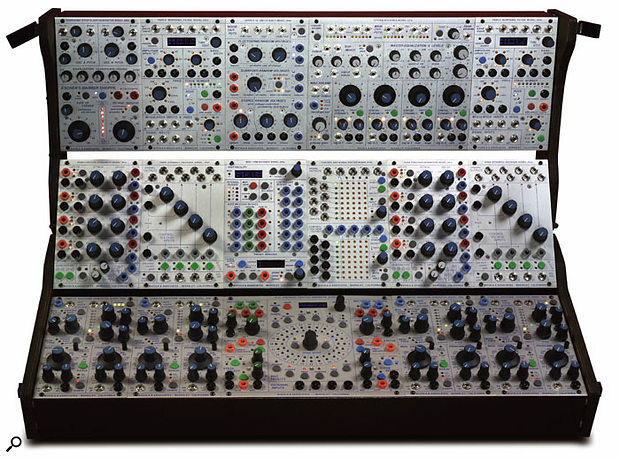 There are 16 modules installed in the review instrument [see the zoomable picture above] but their functions are not always obvious, because Buchla (as on many of his products) describes modules and functions with rather obscure, non-standard names. But the overriding impression is one of density. There are more knobs, buttons, sockets, LEDs and screens per square inch than on anything else I can recall. This makes the 200e incredibly rich in features, and has an attractive side-effect: it lights up like the Oxford Street decorations at Christmas. Mind you, I would have thought that, on an instrument costing this much, it would have been reasonable to ensure that all the modules lined up perfectly with nicely finished edges, and that it would be finished with solid wood end cheeks (and nicely polished ones, at that) rather than cheaply stained nine-ply. But nine-ply it is. And don't get me started about the cheap plastic clips that hold the 200e closed for transportation (see photo below). My concerns about the build quality do not end with the cosmetics. The pots wobble to an alarming degree, and while I accept that there are 30-year-old Buchlas still working out there, I admit to concerns about the reliability and longevity of the 200e's controls. 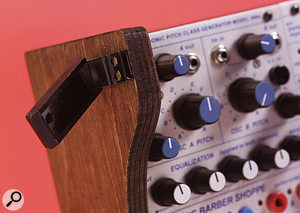 In the same vein, Buchla has maintained his time-honoured habit of differentiating between audio signals and control signals (as explained later in the 'Making Connections' box) by using 3.5mm sockets for the former and banana sockets for the latter. The banana sockets require a significant amount of force to insert and remove the plugs, which ensures a good connection, but I just feel that, if I push or pull at an angle, something is going to snap. This makes me nervous. Round the back, each boat has two cut-outs for I/O sockets. On the lowest boat, both cut-outs are covered with blanking plates. 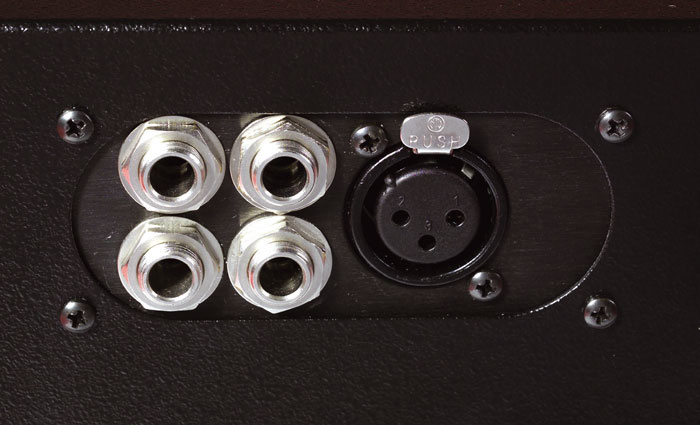 The middle boat has one cut-out blanked off, but the second offers MIDI In and a second — presumably MIDI Thru — socket. I say 'presumably', because neither is marked. There's also a small, blanked-off and unmarked space for a third socket. I suspect that this is for USB, because it lies behind the Model 225e MIDI/USB Decoder module, but once again, there's no legending. The uppermost boat also has one cut-out blanked off, but the second offers four quarter-inch audio signal outputs and a female XLR microphone input (shown opposite). You only get these if you have the Model 227e System Interface Module installed. 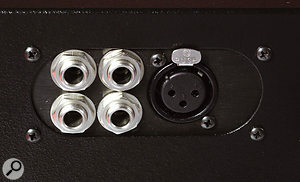 If it is not, you have to use 3.5mm front-panel sockets as outputs. There has been some concern expressed on the Internet about the electrical specifications of the 200e, and its ability to interface with other modular synths. This is well founded; the 200e's pitch CV scaling conforms to neither the common 1V-per-octave or Volt-per-Hz standards. To maintain compatibility with the original System 200s, the scaling is a little less than 1.2V-per-octave, so you're not going to be able to take a pitch CV from the 200e and use it to drive other manufacturers' synths, nor vice versa. Indeed, if you don't have the 200e's own MIDI/CV converter, you're going to find it very difficult to play conventional melodies on this synthesizer. Happily, the other voltages lie in standard regions. Control voltages and timing pulses are +5V (signals with sustain) and +10V (transients only), and summed audio signals peak at around 10V peak-to-peak, so these should be compatible with most other manufacturers' devices. However, the 200e's 'wall-wart' power supply is rated at just 12V, which means that — notwithstanding the depth of the boats — the 200e is not as compatible with Series 200 modules as many people first thought. That's because some of the original 200 modules ran off 15V rails. Indeed, Buchla's web site admits that the 200 and 200e are only compatible with 'some physical constraints, and occasional power supply restrictions'. 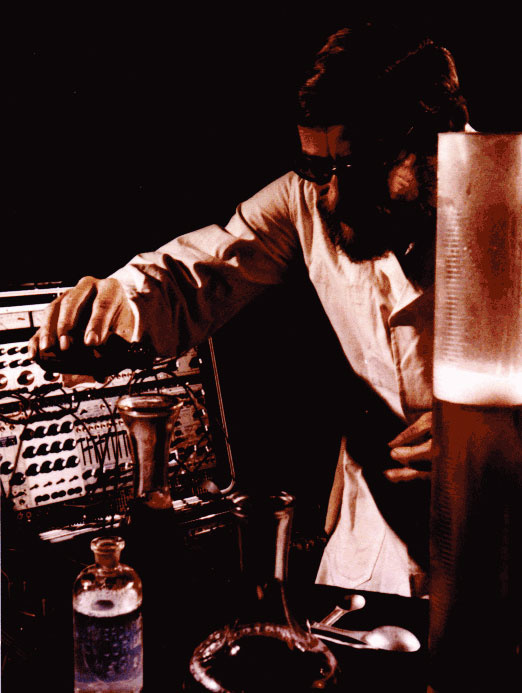 Donald Buchla was born in California in 1937, and proved to be an eclectic talent, with interests in music, physics and physiology, working at various times in the fields of biophysics research, music composition languages, biofeedback and physiological telemetry systems. He even invented aids for visually impaired people. But it is for his developments in the field of music synthesis that he will, perhaps, be best remembered. Aided by a $500 grant from the Rockefeller Foundation, Buchla built his first synthesizer in 1963. 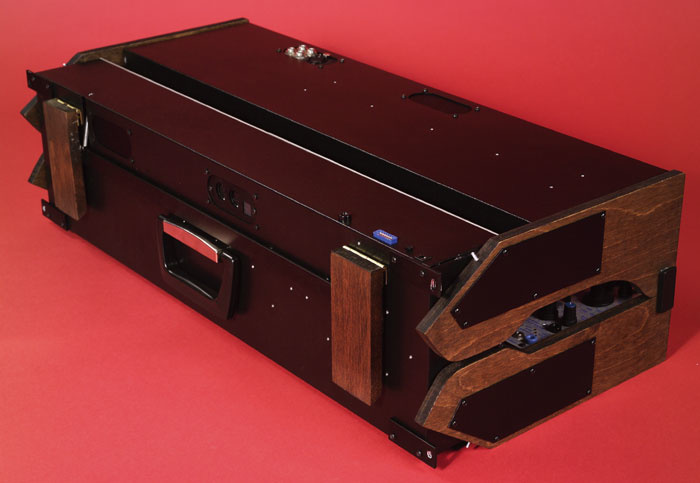 Called the 'Model 100 Series' Electronic Music System, this was very different from the instruments being developed contemporaneously by Bob Moog. Buchla's approach concentrated on the development of innovative sounds rather than the performance of traditional melodies. His ideas were (and remain) esoteric, appealing to educational establishments and to avant-garde musicians, rather than to the mainstream. But it would be a mistake to dismiss the Model 100. The '50s had been a decade of fascinating experimentation into electronic music composition and replay, but progress had been incredibly slow, limited by the cumbersome tape-based methods available for sculpting sounds. Buchla's 'voltage-controlled' synthesizer, while abstruse and impenetrable by today's standards, was a huge step forward that allowed composers to control sounds in real time, to connect to external devices, and to reproduce results with a modicum of consistency. In addition to the Model 100 and 101 cases, which respectively hosted up to 15 and 25 of the 7.5 x 4.25-inch modules, Buchla's new company, Buchla & Associates, set about manufacturing an increasing number of building blocks for the 100. I have identified 39 modules in the series (see overleaf for a list). Of special note are the Model 117 dual proximity detector (with its Theremin-style antennae), the Model 123 and Model 146 sequencers (which could simultaneously control the pitches, amplitudes, and durations of sequences of notes), the Model 148 harmonic generator (which synthesized sounds from their first 10 harmonics), the Model 185 frequency-shifter, the Model 195 Octave format filter (which divided a signal into 10 frequency bands), and the Model 196 phase-shifter. When you consider that the first of these appeared in the year that JFK was assassinated and the Beatles first topped the charts, you get some idea of the pioneering nature of Buchla's early work. Despite this, it was not Buchla's synthesis that differentiated him most from other synth pioneers, nor which limited his penetration into the mainstream. This was determined by his 'Touch-controlled voltage sources'... or, as you and I would call them, keyboards. Buchla was a true disciple of the avant-garde, and did not believe that the potential of his new musical instruments should be limited by the constraints of the 12-note, even-tempered octave, or by a black and white piano keyboard. He therefore eschewed conventional mechanical keyboards, and provided pressure-sensitive touch-pads such as the Model 112, which had contacts arranged in a straight line, and the Model 113, whose concentric circles generated voltage changes at its outputs rather than absolute voltages. Although you could tune the outputs of the 112 to a chromatic scale, its geometry made conventional keyboard playing impossible, and forced players to think differently about the composition and performance of electronic music. 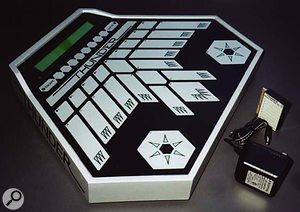 In the May 1994 edition of SOS, Suzanne Ciani (who had at one time worked on Buchla's production line) explained the appeal of this, saying, "I saw the black and white keyboard as an inappropriate interface. With the Buchla synthesizer, I used a touch keyboard, and I could have 20 different things happen and not just one note." Having said that, she then admitted that her Buchla had ended up under her bed after she had sampled its sounds into a Synclavier! 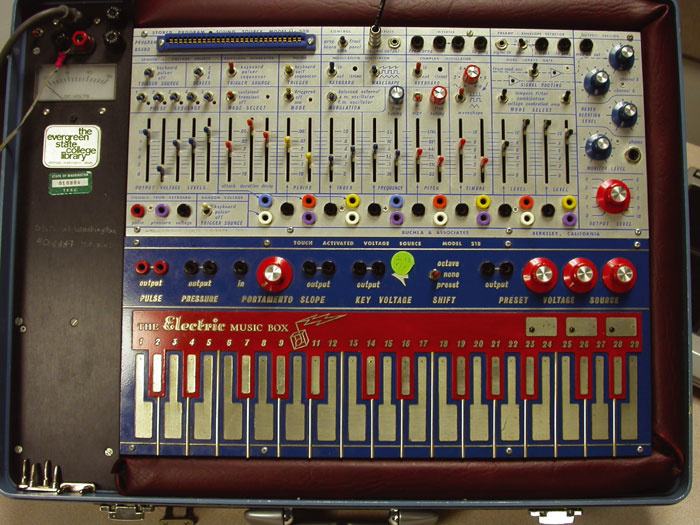 Buchla's controllers were well suited to the experimental 1960s, but musicians still wanted to play tunes, and the Model 100 was unforgiving in this regard. Even if you tried, the oscillators were unstable and prone to drift, so Buchlas remained sidelined in colleges, or used by a tiny handful of electro-music pioneers such as Morton Subotnik and Walter (pre-Wendy) Carlos. Even a brief manufacturing arrangement with CBS failed to bring commercial success, and by the time our story enters the 1970s, Buchla's instruments were being heavily outsold by new synthesizers from Moog Music, as well as by newbies EMS and ARP. 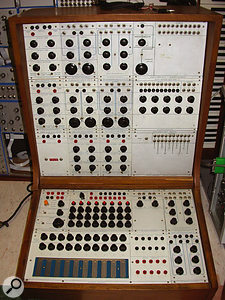 The Model 100 remained in production until 1970 or thereabouts, when Buchla replaced it with the Series 200 Modular Synthesizer. Buchla was now looking to the mainstream, and he bowed to market pressure by adding the Model 218 and 219 touch-sensitive keyboards (later superseded by the Model 221) which had their pads arranged in conventional keyboard fashion. Later, he even introduced two polyphonic, velocity- and pressure-sensitive mechanical keyboards for the series; the three-voice Model 237 (three octaves) and the four-voice Model 238 (five octaves), the latter of which even incorporated a digital output for connection to mini-computers. But, long before the Model 238, Buchla had in 1971 embraced digital technology and developed the world's first 'digitally controlled analogue' synth, the Series 500. We know that this was based on an Interdata 7/16 mini-computer and that it used a piano-style keyboard as an event-input device but, other than that, little information exists in the public domain. It's likely that only three were built, and only two are known to have survived. In many ways, the Series 500 was a diversion. It embodied many innovative ideas that would later be refined by other companies, but throughout the 1970s, the Series 200 remained Buchla's only commercially viable product range. To make this more accessible, the company supplied a range of pre-configured systems. The smallest and most affordable of these, introduced in 1972, was the System 200-081 Music Easel. Costing a tad under $3000, and housed in a briefcase much like an EMS Synthi AKS, the Easel's sound generation was provided by a single Model 208 module. This combined an oscillator with voltage-controlled waveshaping, an external signal input, a modulator that provided amplitude modulation and filtering, a noise source, a contour generator, a clock/envelope generator, an output mixer, and a reverb. The Music Easel could even store patches on 'program cards' — a startling idea in a decade when most musicians' 'patch memories' were pieces of paper with scribbled pictures of knobs and sliders. However, you could only store your patch by soldering the appropriate values of resistors onto the card! Buchla supplied six blank cards and a pack of resistors with each Model 208, leading some to claim that it "offered six memories"! Buchla returned to digital technology for the Series 300, which was a marriage of Series 200 modules and a computer system comprising an 8080 eight-bit CPU, a floppy disk drive, video monitor, interfaces to the synth modules, and a music language — Patch IV — developed for the system. Then, in 1978, he developed these ideas further, with Touché, a duophonic, three-oscillator-per-voice, eight-voice polyphonic, quadraphonic digital synthesizer based on a 16-bit processor and another dedicated music language. This embodied many radical ideas, such as the crossfading of one sound to another, and the ability to record phrases in real time and then loop and transpose them during live performance. At $8500, Touché was more expensive and far less intuitive than a Prophet 5 or Oberheim OBX, so it was never going to be a huge commercial success, despite its groundbreaking technology — and it wasn't. Only a handful of units were made. By the end of the 1970s, Buchla was very much an outsider in the market that he had helped to create. Nevertheless, he continued to push at the edges of synth design. His next instrument, the Buchla 400, incorporated three CPUs, each dedicated to a specific area of sound generation. The first performed housekeeping and user-interface duties. The second controlled the sound generator, and the third — which may have been based on the Touché — generated the sound itself. All of this was controlled by yet another language, 'MIDAS', written in a version of the FORTH programming language. The 400 was capable of interfacing with the Series 200, and many of its functions, such as the display and editing of voices, analogue-style editing, programmable FM, multiple scalings, notation, and its SMPTE timecode facilities, were radical at the time. Its six-voice sequencer was also worthy of note. Designed primarily to play the voices within the 400 itself, this offered note editing, insert, copy, move, loop and delete commands. You could even plug a CRT directly into the 400, and view the sequence in grid form. This was in 1982, a year before MIDI, and long before home computers (let alone Macs and PCs capable of running sequencers) became commonplace. 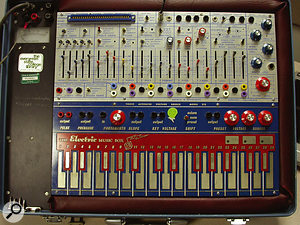 In 1987, the 400 was replaced by the Buchla 700, which for a long time appeared to be the last of its dynasty. This incorporated four CPUs, the extra one of which handled incoming/outgoing analogue and digital data, including that from dual RS232 serial ports and multiple MIDI inputs and outputs. More powerful than the processors on the 400, these allowed Buchla to increase the number of sound-generating variables and their resolution. 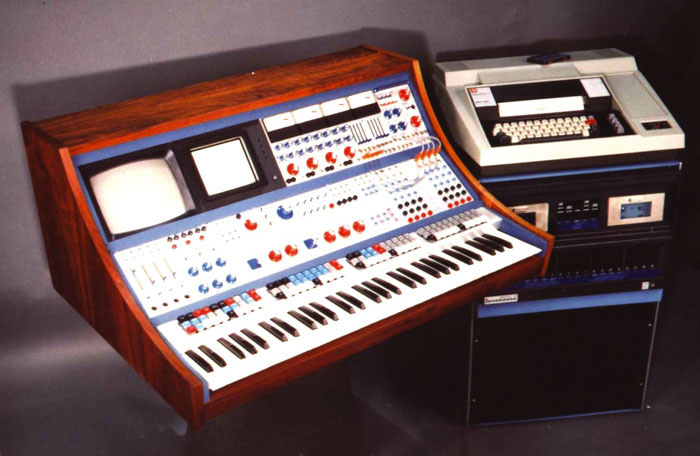 Nevertheless, the 700 was still recognisably a Buchla, with touch-sensitive pads rather than a keyboard, and (I quote from the brochure) 'position-sensitive transducers used to implement conceptual potentiometers, flywheels, switches, ribbon controllers, and other gesture-sensitive paraphernalia'. 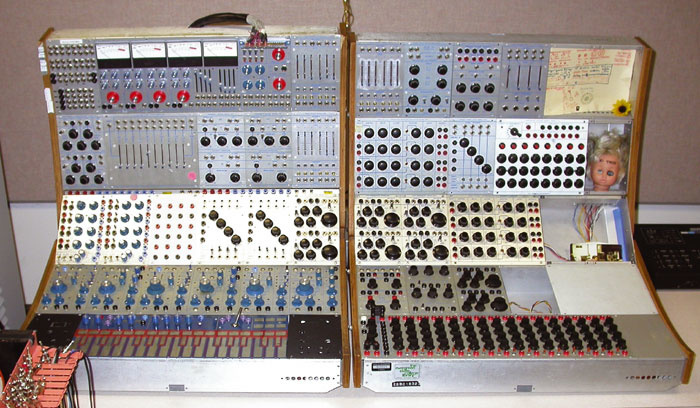 By the end of the 1980s, Buchla had started to turn away from synthesis itself, and all his products in the 1990s were controllers of one sort or another. The DSP-based Thunder MIDI controller provided a hexagonal playing surface with 26 touch-sensitive pads, and this was complemented by the following year's Lightning and its successor, Lightning II. 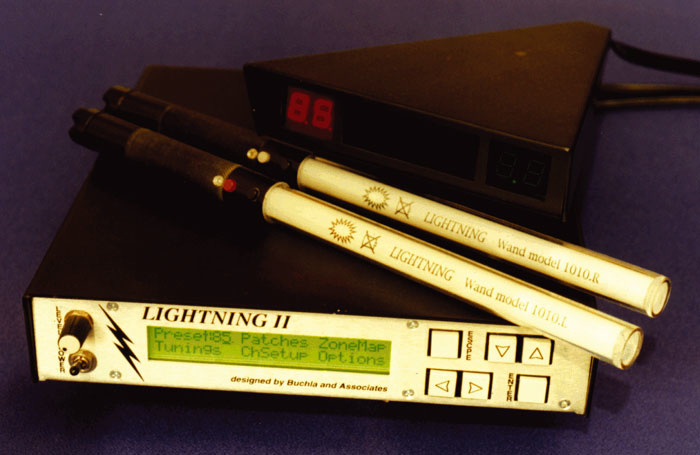 These units translated the motion of two hand-held wands into MIDI information that could be transmitted and/or used to control an internal 32-voice synth. The final Buchla of the 20th century was the Marimba Lumina, a self-contained instrument comprising sets of illuminated bars, pads and strips played using mallets. Inevitably, it had a few facilities not available on traditional marimbas, including an internal synth and the ability to recognise which of four types of mallet had struck any given bar, each having a different, programmable action upon the sound. 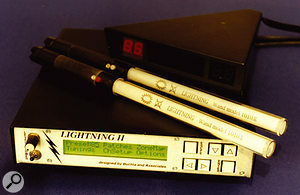 A smaller version, the Marimba Lumina 2.5, was released in 2002. Shortly after this, Buchla elected to return to his designs for the Series 200, which eventually resulted in the release of the 200e under review here. The ability to patch the 200e as a conventional, analogue, modular synthesizer does not mean that it is a conventional, analogue, modular synth. The documentation describes the 200e as an analogue synthesizer because, as it states, "we are describing the aspect that the user contacts as analogue". In other words, because the 200e presents you with knobs and analogue patch points, it's an analogue synthesizer. Many people have great difficulty accepting this, and I count myself as one of them. 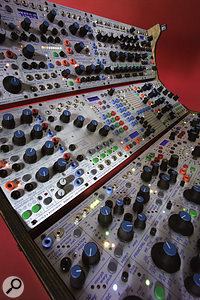 As Buchla admits, the sound generation itself is an ad hoc mix of analogue and digital techniques, and the use of it was to some extent determined by economic factors, as well as by the obsolescence of some of the components used in the original 200-series modules. Take the 259e Complex Waveform Generators as an example. Buchla states that 'there are no compelling reasons to employ analogue circuitry in the oscillators', so both oscillators within a 259e are digital. In essence, only their controls and outputs are analogue. The same is true for the 260e Shepard tone generator and the various S&H sources in the 266e Source Of Uncertainty. In contrast, many of the remaining modules use digital control signals coupled to analogue signal paths. These facts alone are enough to cause paroxysms in analogue purists, but what limited information that exists about the digital side of the implementation also concerns me. That's because, while Buchla claims that there is no zipper noise in the 200e, he stated some time ago that control parameters are quantised at between eight and 12 bits, depending upon their purposes. The FAQ page on Buchla's web site states that the range of resolutions in the ADCs and DACs in the 200e is six to 16 bits, but I understand that the 16-bit converters are used only for audio signal conversion, not CVs. Anyway, although 12 bits are adequate for many functions, they may be insufficient for others. To illustrate this, consider the example of two oscillators tuned to almost, but not exactly the same pitch. The differences in beat speeds between subtle degrees of detune is extremely important when creating 'chorused' timbres and, depending upon how demanding you are, even 12-bit resolution could be insufficient for adequate control over such sounds. As regular readers of SOS will know, I'm not an analogue purist. Provided that it's advanced enough, I don't think that the use of digital technology in the audio path is anything to be ashamed about, especially when it offers sound-generation opportunities that would not otherwise be possible. Consequently, I'm mystified as to why Buchla — who has been designing digital oscillators since the Model 500 in 1971, and who seems willing to use the most appropriate technology for the task — would seek to obfuscate the issue by describing the 200e as 'straight analogue synthesis'. 144 Dual square wave oscillator. 156 Dual control voltage processor. 165 Dual random voltage source. 175 Dual equaliser line driver. Note: the modules adorned with a red star are not shown on Buchla's own web site, but other sources suggest that they existed nonetheless. 248 Multiple Arbitrary Function Generator (MARF). 256 Dual control voltage adder. 257 Dual control voltage processor. 259 Programmable complex waveform generator. 264 Sample & hold/polyphonic adaptor. 284 Quad voltage-controlled envelope generator. What's not apparent until you start to use the 200e is that there are 14 busses within the synth, some provided as patch points, and others running between the modules and boats along cables tucked away within the chassis. You manage and control these from the upper panels on the Model 225e MIDI/USB Decoder. This is, for most purposes, the heart of the synth. The other four busses (A, B, C and D) are not accessible via patch points but, with all the appropriate Remote Enable switches on, are hard-wired to their destinations, conveying (on the SOS review configuration) pitch information to the four 259e modules, velocity information to the A, B, C and D sockets on both 292e modules respectively, and Gate signals to the A, B, C and D sockets on both 281e modules respectively. In many ways, these busses are the keys to the 200e, because they cause the oscillators to track incoming MIDI notes, they trigger the contour generators, and they provide velocity information to the combined filter/amplifier modules. They should also respond to pitch-bend messages, but, again, this would appear not to be implemented yet. Of course, you won't get a peep out of the 200e unless you patch its modules together (the bussing provides only the converted MIDI control signals, not the sounds and CVs themselves) but with the busses set up correctly and the right connections between the modules, you're in business. For example... Given that you can set each of A, B, C and D to an independent MIDI channel, and that this 200e system incorporates four primary oscillators, eight contour generators and eight filter/amplifier pairs, it's simple to patch it as four independent monophonic synthesizers. Alternatively, set each of the A, B, C and D busses to the same MIDI channel and to 'Poly', and incoming notes will be distributed correctly to the oscillator/contour/amplifier sets of modules, which you can then mix into a conventional four-voice polysynth. Once you've done so, you'll be able to develop sounds that are unlike anything you'll obtain from any simple, integrated MIDI synthesizer. One significant difference between Buchla's approach and that of Bob Moog was his separation of the signals used in synthesis into three distinct classes. First, there were the audio signals, which could be generated by oscillators, or injected into the system from devices such as microphones or tape machines. Secondly, there were the control voltages. Finally, there were timing pulses, which we nowadays call clocks, gates, and triggers. By today's standards, the audio levels were quite low (about 1V peak-to-peak) and the CVs and pulses were rather hot, with a maximum voltage of around 15V, but the strangest thing about them was that Buchla used different types of sockets for each class, so that you couldn't interconnect them. In contrast, Moog saw every signal as simply a signal, without differentiation, and it was this approach that would later become the overriding model of analogue, subtractive synthesis. While Buchla accepted that there were advantages to the non-differentiation of sounds and the signals controlling them, he justified his approach on engineering grounds: specifically, that if a signal has to work in both ways, the circuitry has to be a compromise. For example, he suggested that DC offset is irrelevant in the audio domain — a view that I don't necessarily accept — but is important in the control domain. Conversely, he stated, a certain amount of harmonic distortion is largely irrelevant in the control domain, but has obvious consequences in the audio domain. Those arguments have some merit, but his assertion that using two types of sockets and cords made it easier to see what was going on is, to me at least, more questionable. On the 200e, the CV and timing sockets are colour-coded as follows: the CV inputs are black and grey, and the CV outputs are blue, violet, and green. The pulse inputs are orange, and the pulse outputs are red. There seem to be no differences between the colours used for CV inputs, and between those used for CV outputs, so I suspect that the multiple colours were chosen for nothing more than aesthetic reasons. It's clear that this 200e system is not only a fantastically powerful modular monosynth, it can be a four-part multitimbral synth, or a four-voice polysynth. But hang on... haven't I seen this before somewhere? Yes, I have. The philosophy of the 200e is remarkably similar to that of the Oberheim 4-Voice, the world's first 'integrated' polysynth, and an instrument that was revered as a technological marvel when launched in 1974. 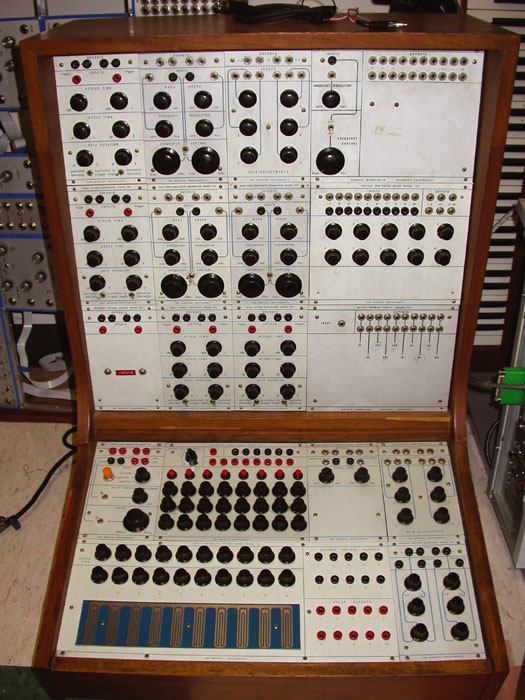 Some of these Oberheims were later modified with individual patch-points in each of their SEM monosynth modules, so the parallels are even closer. With this in mind, I thought that it would be interesting to compare the prices of the two. The earliest retail price I have for the 4-Voice is around $5500, which equates to around $40,000 at today's prices, and is therefore double the asking price of the 200e. 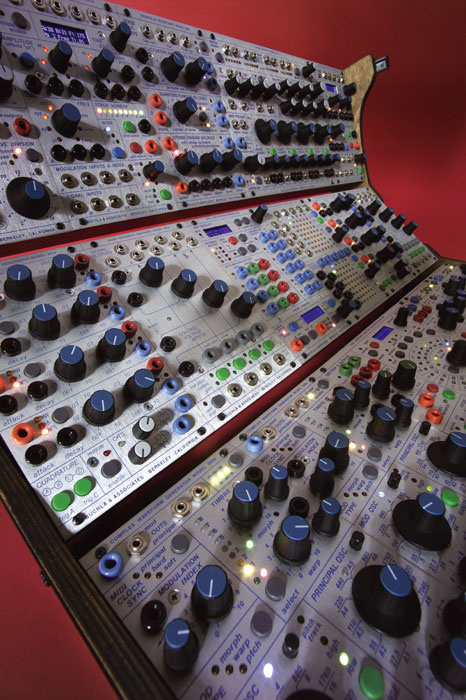 Of course, the Buchla offers facilities undreamed of in 1974, and many of its modules could justify reviews in their own right. This isn't possible, but next month I'll look at each of them in turn, patch a few sounds, and try to draw some sort of conclusions about this remarkable synthesizer. Peter Randlette with Evergreen College's Series 200 Buchla synth.Photo: Peter Randlette Founded in 1971, Evergreen State College is a liberal arts and sciences college in Washington state, in the USA. Since the earliest days of the college, music technology has been part of its curriculum, and it has always offered its students access to recording facilities. There are three acoustic recording studios with classic API desks, plus the four so-called Electronic Music Labs. The latter rooms are packed with equipment from all ages of music technology, including Oberheim, ARP, Moog and Emu analogue synths, analogue multitracks, and computers running MOTU's Digital Performer, as well as many other synthesis and recording packages. Three of the labs have had rare Buchla synths in them for years, which are still in everyday use: a Music Easel, a Series 100, and a large Series 200 system. Evergreen Media Services staff member Peter Randlette, 50, arrived at Evergreen as a student in 1975 and now runs the Music Technology Labs at the college. He's been responsible for looking after the Buchlas and keeping them in working order for many years. He even acquired the Series 100 from the University of Washington for the college and oversaw its refurbishment and reassembly. It's necessitated a trip or two to Buchla's laboratory and much scouring the world for spare parts, but he says it's all been worth it. "The students connect with these instruments immediately," he says. You can spend a morning with them explaining how Performer works, whereas when you put them in front of the Series 200, they get it straight away, which is a testament to Don's user interface design." The college now also owns a 200e. "It sounds amazing, and the DARF [Dual Arbitrary Function Generator] is a real hit with the students," says Peter. For more on the vintage goodies at Evergreen, see www.evergreen.edu/media/musictech/home.htm. As the 200e is a modular system, there is no set price for it, but it's fair to say that the constituent modules and their case do not come cheap. It's sold in the UK by distributors RL Music, and a detailed, module-specific price list is available from their excellent web site, www.rlmusic.co.uk. However, there are no UK sterling prices for the 200e — the prices are shown in dollars, so the cost to UK customers fluctuates with the exchange rate. What's more, the prices shown on the web site do not include UK customs duty, which is payable, nor UK VAT at 17.5 percent, nor the cost of transporting your purchase to the UK from California — and safely shipping a large, delicate system to the UK like the configuration SOS used for review could cost quite a bit. Suffice it to say that the total cost of the modules and case comprising the SOS review system comes to a not-insignificant $19,850. At the time of going to press (late October 2005), this equates to approximately £11,115. And don't forget, that's not including UK customs duty, VAT, or shipping costs. It's certainly not what you'd call an impulse purchase! While it's safe to say that there are few people the world over who will pay for this kind of system, many more modular aficionados might be keen to add a little of the 200e's unique character to existing setups. 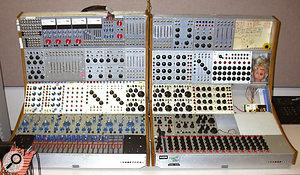 Understanding this, Buchla & Associates also supply four smaller cabinets. As the numbers suggest, the 201e12, 201e6, 201e4 and 201e2 will house 12, six, four or just two standard modules. Perhaps the most interesting of these is the 201e6, which is the middle 'boat' from the full 200e18 pictured here. This costs $700 (currently around £400 excluding shipping, VAT, and UK duty), and I understand that, if you later upgrade to a full system, the company will allow you to trade this in for credit against the purchase of the three-boat cabinet, currently quoted at $1400 (about £800 without the shipping, VAT, and duty). RL Music +44 (0)118 947 2474.